As most Boy Scouts know, the organization was founded in Great Britain in 1908 by Lord Robert Baden-Powell. The Boy Scouts quickly became an international movement and, in 1910, the Boy Scouts of America (BSA) was incorporated and communities throughout the United States quickly established their own councils and troops. Oak Park was no exception. By 1916, the year the BSA was granted a Congressional Charter, 15 troops had been established in the area and both recruitment and fund raising drives were well underway. In a two week period in early March, the president of the BSA was in Oak Park to lend his national prestige to the effort and the BSA’s national field commissioner graced the cover of the Oak Leaves as he too visited the village to promote scouting. Midway between those two events, on March 16, yet another troop, Troop 16, was chartered under sponsorship of the First Presbyterian Church (now First United Church of Oak Park at 848 Lake Street). 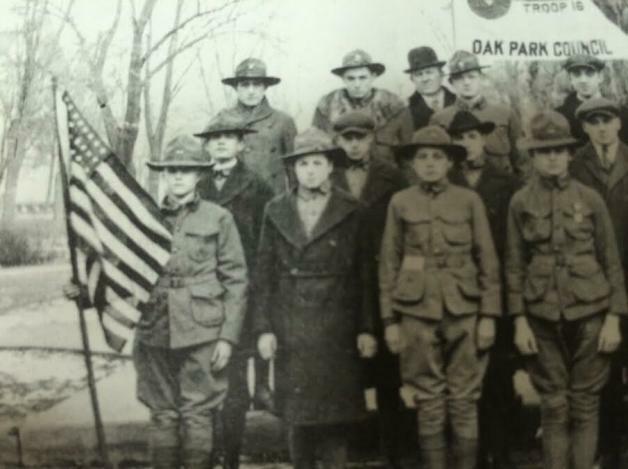 Today, 100 years later, Troop 16 celebrates its anniversary as the oldest remaining troop in Oak Park. Eight boys from Presbyterian’s Sunday school class were the first scouts and Wilbur Graham, an industrial arts teacher at Oak Park River Forest Township High School (as it was then known) reluctantly agreed to serve as temporary scoutmaster to “see how it works out”; 32 years later he stepped down, setting a longevity record for the troop. What began with eight scouts soared over the years to what is now about 1800 scouts; today there are approximately 120 scouts in the troop. Some may ask why the troop has survived this long while other troops have come and gone. Research suggests that Graham instilled in his scouts the spirit of at least two tenets which continue to drive it today as an organization focused on developing Oak Park area boys into productive and responsible young men. The first is that it was, and is, a scout-led troop—using the “patrol method” by which scouts are arranged into small peer groups for the purpose of developing leadership and camping skills. Older scouts lead young scouts in their meeting programs, camping trips and community service activities. Community service has been a staple for Troop 16. During World War I the troop sold $25,000 in Victory Bonds and tended Victory Gardens; in World War II they again sold war bonds and ran metal collection drives. Annually, for at least 20 years, they have conducted the Thatcher Woods Cleanup around the Des Plaines River. They have repaired Hephzibah Home’s fleet of bikes, trikes and wagons; sandbagged during Des Plaines River flooding; and worked with many organizations including the Oak Park River Forest (OPRF) Food Pantry, OPRF Fire Department, First United Church, Pilgrim Church and the Historical Society of OPRF. The second tenet is that the troop has always had an active outdoor program because, according to current Scoutmaster Terry Dutton, “the outdoors is the classroom of the scout.” Be it summer camps or monthly hikes in 1930 or 2015, the scouts have learned by doing it themselves. They become self-reliant, and inter-reliant, and learn to problem-solve, persevere, empathize, communicate, negotiate and celebrate together. Summer camps have primarily been in states bordering Lake Michigan, but the scouts have also travelled to Canada and throughout the United States from Alaska to the Florida Keys. The Troop 16 100th Year Anniversary Reunion is being held June 4 at the Thatcher Woods Forest Preserve Facility on Chicago Avenue. For information on the troop visit its website at http://www.troop16oakpark.com/.